Arnott and Vederoff Ancestors - "A Tribute of Loving Rememberance by the Grand Children of James and Margaret King who died in 1861 and 1864." Zion Cemetery, Kingsland, Camden County, Georgia. 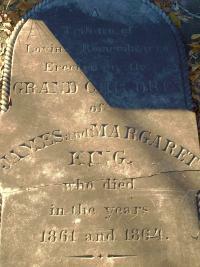 "A Tribute of Loving Rememberance by the Grand Children of James and Margaret King who died in 1861 and 1864." Zion Cemetery, Kingsland, Camden County, Georgia.